Emmanuel’s annual parish weekend at Shrine Mont takes place over Labor Day weekend each year, Friday dinner through Sunday lunch. 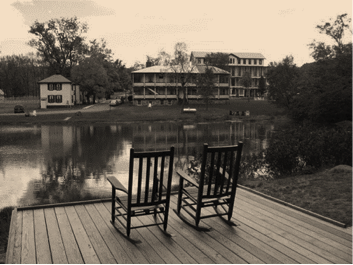 The retreat is designed to bring us together for fellowship, recreation, reflection, worship and song. Participants can take part in all activities or just a few. Everyone is welcome—family and friends—and scholarship assistance is available by request to the rector. Participants stay in cottages with porches or traditional rooms in Maryland House. Indoor activities take place in the four-story Virginia House, which was built in 1873 and is listed in the National Register of Historic Places. Buffet meals are served in the dining hall there. During the retreat, you can bike, hike, swim, explore nearby wineries or cideries, or simply sit on the porch and enjoy the view. There are intergenerational games, a hymn sing, and prayer boats set to float at evening Compline. The Shenandoah Music Festival goes on Saturday night, featuring a national act that you can hear from the porch. Sunday morning worship is held at the outdoor cathedral at 11 AM, a natural setting where God’s presence can easily be felt. Shrine Mont is located in Orkney Springs, VA about 13 miles west of Mt. Jackson and an hour north of Harrisonburg. Follow I-81 North to Mt. Jackson (Exit #273). Turn right onto Rt. 703 (East), then right (South) on US 11, follow through town, turn right on Rt. #263 and follow approximately 13 miles to Orkney Springs. The drive is approximately 1 ½ hours from Greenwood. All meals are included in your registration fee. You might want to bring your own snacks or alcoholic beverages for social hour. We provide coolers, as well as sodas and water. Suggested items to bring: Folding chairs, flashlight, sweatshirt, rain gear, water bottle, games, favorite pillow, extra towels, pool towels, sports equipment, sturdy shoes and a smile. Cell service is minimal. Wi-fi is available in the Virginia House lobby. Do not bring pets, radios, boom boxes, squirt guns, or water balloons. Skateboards and roller blades are not allowed. Fireworks or firearms of any kind are prohibited. Because of the wooden buildings, smoking is not allowed inside. Register now for Shrine Mont! Paper forms are in the Parish Hall, church office, or included in email announcements. You may print the registration form here and fill it in by hand. For ease of accounting, please pay by check or cash at the office. ​Make checks payable to Emmanuel Episcopal Church with Shrine Mont in the memo. Bring the form and payment to church or the church office. You may also place it in the Shrine Mont folder in the Parish Hall. Rates are per person and include two nights lodging and six meals, access to pool, trails, and all on-site activities. There is a $400 maximum fee per family for the weekend. We welcome friends and guests, but do not include them in the family maximum. Please add them at per person rate. If you wish to receive financial assistance, see our interim rector, The Rev. Neal Goldsborough or email ngoldsborough@emmanuelgreenwood.org.